Large size: 5" x 8"
Ah, the sweet and soothing scent of lavender! Quiet your mind and deepen relaxation with our luxurious Large Silk Eye Pillow. This eye pillow is lightly scented -- filled with a calming blend of earthy organic flax seed and dried lavender blossoms. The gently weighted pillows help calm the mind while subtly adding weight over the eyes and completely blocking out light. Our large eye pillows are a great tool to enhance meditation, Shavasana, and relaxation or restorative poses. The soft silk cover is removable for easy cleaning. 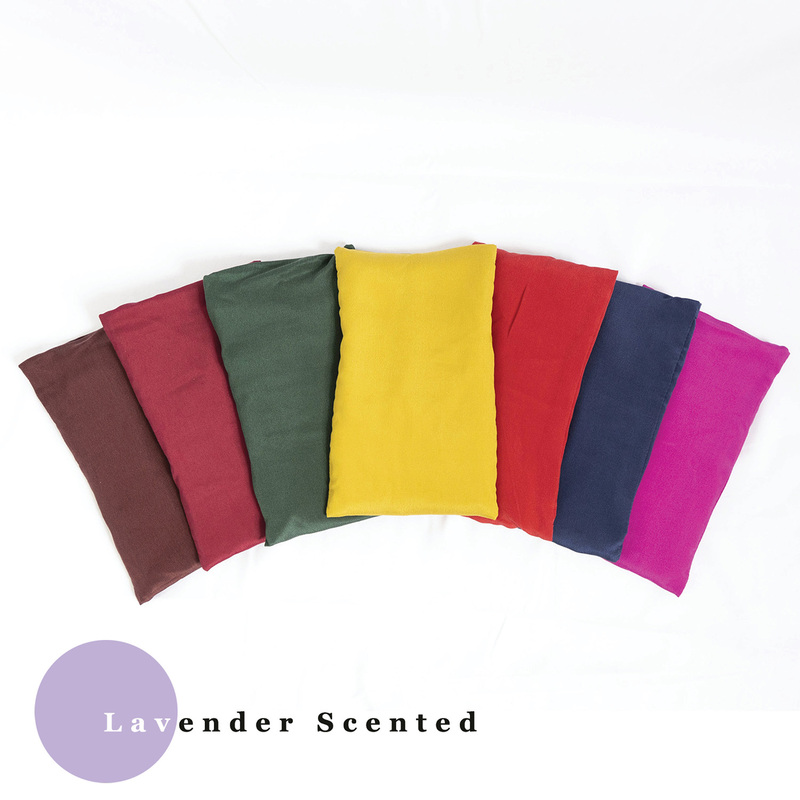 This eye pillow is also available with a cotton cover, without lavender, or in a smaller size. Pro Tip: Prolong scent by storing your eye pillow in a Ziplock bag. To deepen relaxation, our flax-filled eye pillows can be heated by removing the cover and placing in the microwave for 30 seconds to one minute. To cool, remove cover and massage in a few drops of peppermint essential oil into the pillow. Place in freezer for at least two hours prior to use. Perfect size, weight, texture and not overpowering in scent. I'd definitely recommend these! My students love getting these as a nice treat during savasana! very soothing and relaxing. Right size, weight and feel. The size, the feel and the scent are perfect. Students love them. Very relaxing. Love this product. Excellent value! These are great eye pillows Everyone loves them. Also I like that I can take the covers off to wash them. I love that these are oversized!!! I bought a LOT of eye masks for the many bedrooms scattered around my kingdom (ok, house), taking a bit of a risk because they were so inexpensive. They're perfect (AND inexpensive): the right weight, the right fabric (not too slippery) and just a wee bit (not a tsunami) of lavender. Ya welcome. Order additional ones as gifts for friends and family! Absolutely love mine! Ever since I got it, I've been using it for naps, relaxing, and helps me fall asleep. Everyone should have one of these! These eye pillows provide the best relaxation whether you are into yoga or not.